In a new concept for battery cathodes, nanometer-scale particles made of lithium and oxygen compounds (depicted in red and white) are embedded in a sponge-like lattice (yellow) of cobalt oxide, which keeps them stable. Engineers from MIT propose that a new lithium-oxygen battery material could be packaged in batteries that are very similar to conventional sealed batteries yet provide much more energy for their weight. 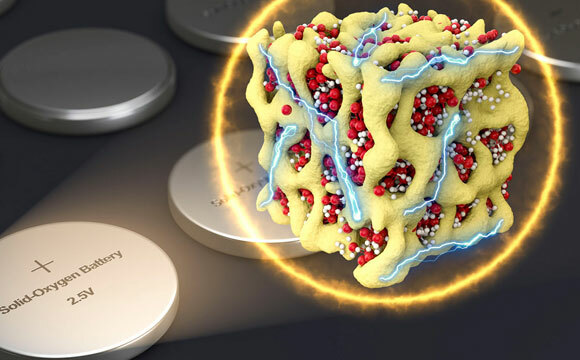 1 Comment on "New Battery Could Overcome Key Drawbacks of Lithium-Air Batteries"
I read some time ago that the new carbon material, graphene, was to be the main ingredient (with manganese) in a new super capacitor that would replace batteries in E-vehicles. Capacitors charge much more quickly, and will take charges from charging devices on the vehicle such as field reversing motors in an instant, without the usual lag that exists with lithium batteries, before the battery is ready to take a charge. I am curious why more time and energy are not put toward what seems to be to me an obvious light weight alternative, and less temperature dependent source of energy for E-vehicles. Has graphene capacitor development stalled at this point?